ONE OF A KIND – Shandala Birth Certificate!!! Own a little piece of (fake) history!!! Sarah Brind and the kind folks at FOX UK have been doing their darnedest to spread the saintly word before the release across the pond later this month…and the goodie to the right is a wondefully unique expression of those efforts! 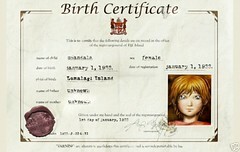 Here’s the poop – they’ve cobbled together a makeshift birth certificate for Shandala, and posted it on EBAY. It’s framed and signed, and the proceeds will be going to a charity of our choice. All you gotta do (especially easy if you live in Britain, mateys) is get the bidding rolling – the clock’s set at two weeks and counting!!! Reports are rolling in from across North America of Saints Sightings and some pretty good reviews. I can’t say that we’re displeased. If time allows, keep sending us snaps and stories of your intrepid excursions into the concrete jungle, and be sure to mobilize your peeps for prodigious weekend purchasing – the better the DVD does at the outset, the more likely Murdoch’s cronies are to get behind it on all fronts. Slumber calls yet again…oh, to rise and be kissed by that gleaming orb, and to have the sleep cleansed from mine eyes by swollen rivers of heartfelt gratitude. This entry was posted on Thursday, August 3rd, 2006 at 10:21 pm and is filed under Uncategorized. You can follow any responses to this entry through the RSS 2.0 feed. You can leave a response, or trackback from your own site. Walmart is one thing, but when you hit TOYS R US…..now were talking! Dont forget the mocha! Hey I’m one year older than Shan is. Why in the world was her birthday updated to 1988? What, did you change every other year in the entire series to match? She could not have been born when I was born. . .what?? I don’t think the Boston Examiner exists. I’ve never seen it. That website is LIES.